In 2011, severe weather disasters inflicted more than $43 billion in damage, according to the National Association of Insurance Commissioners (NAIC). They estimate that more than 50% of these homeowners did not have an up-to-date home inventory of their possessions. All homeowners should conduct a home inventory, which is a list of your personal possessions along with information about their value. It can prove invaluable in the event that disaster strikes, and it costs nothing but time. Homeowners should organize their inventory in a manner that is appropriate. The task may not be daunting for new homeowners, but it may seem overwhelming to individuals who have lived in the same house for several years. However, keep in mind that an incomplete inventory is better than none at all. Decide what method works best for you. Consider starting with recent or most expensive purchases and working backwards. You can also conduct an inventory by room or item type. A home inventory can serve as a guide to make sure you purchase the amount of insurance you need. A comprehensive list can lead to a more productive conversation with your insurance agent about the value of your belongings. A home inventory will be vital if you need to file an insurance claim, and it can ensure that your claim is settled quickly and efficiently. After a catastrophe, you will need to substantiate your losses to qualify for a tax break or disaster assistance, so a home inventory will be extremely useful in verifying your losses for your income tax return. Essentially, a home inventory lets you take full advantage of your insurance policy. While the task may seem overwhelming, technology can make the process of creating a home inventory infinitely easier. The Insurance Information Institute (III) offers free, downloadable software called Know Your Stuff, which documents your personal possessions and is even available via iPhone. The software allows users to scan receipts or appraisal forms as well as upload photographs. Your inventory is then readily accessible online, which may prove to be a huge benefit if you need to evacuate suddenly in an emergency. The NAIC also offers a downloadable app for iPhone and Android users. Homeowners can also document their belongings using a checklist provided by the NAIC. Individuals who opt to use the checklist should make sure they photograph and/or videotape their items. Descriptions should include the age, purchase price, and the estimated current value of their possessions. Make copies and keep receipts of all major purchases. 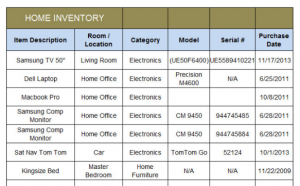 Record the model and serial numbers of electronics and appliances. For clothing, count the items you own by category, such as pants, coats, and shoes. Make notes about any clothing and accessories that are particularly valuable. However, keep in mind that expensive items such as jewelry, art work, and other collectibles may not be covered under your existing insurance policy. In some cases, big ticket items like these may need to be insured separately. Check with your insurance agent to determine whether you have adequate insurance or if you need a floater for your homeowner’s policy. A home insurance floater (or a personal articles floater) is a type of insurance policy that provides substantially higher monetary protection than normal insurance policies. A floater covers high-value items including jewelry, musical instruments, cameras, rare coins, and stereo equipment. Floater insurance assures homeowners that the full value of their belongings will be replaced in the event of theft, loss, or damage. Regardless of how you inventory your home, be sure to make copies and store them in locations outside your home. You may keep it in a safe deposit box, a friend’s home, or online. Consider sharing a copy with your insurance provider. Keep your inventory up to date by adding new purchases to the existing list. Homeowners should keep a record of legal documents, such as birth certificates and passports, as well as financial documents, such as bank accounts and insurance policies. Record information about these documents in your home inventory. You need this list in the event of a claim, especially if you face a total loss, such as a fire.